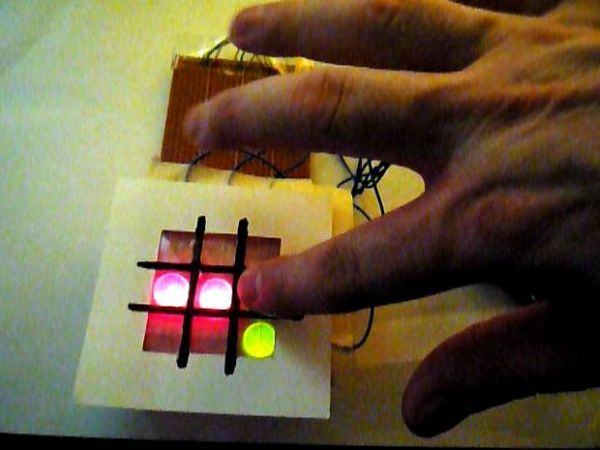 This is an implementation of a tic tac toe game using a 3×3 array of bicoloured LEDs for a display, a simple resistive touchpad, and an Arduino to tie everything together. For an LED to light, both its leads must be connected. If we were to dedicate a pair of pins to each of the 18 LEDs (9 red, 9 green), we’d quickly run out of pins on the Arduino. However, with multiplexing, we’ll be able to address all the LEDs with merely 9 pins! But what if you want to light up more than one LED on different lines? We’ll use persistence of vision to achieve this. By selecting pairs of LED lines very very quickly, it gives the illusion that all the selected LEDs are lit at the same time. The circuit diagram below shows how the LEDs are physically wired up (G1-G9: green LEDs, R1-R9: red LEDs). This diagram is for single red and green LEDs, if you are using bicoloured common cathode red/green LEDs, there’s only one cathode leg per red/green pair that you have to wire up. One way of doing this is to store the state in a 9-cell array, using three digits to represent the state (0 = off, 1 = red on, 2 = green on). Everytime we need to check on the states of the LED, for example, to check if there’s a win condition, we’ll need to cycle through the array. This is a workable method, but rather clunky. Step 2. If it’s true, the LED is lit. Do now a bitwise addition of the colour state with a binary 1. Step 3. If it’s true, light up the red LED. If it’s false, light up the green LED. Step 5. 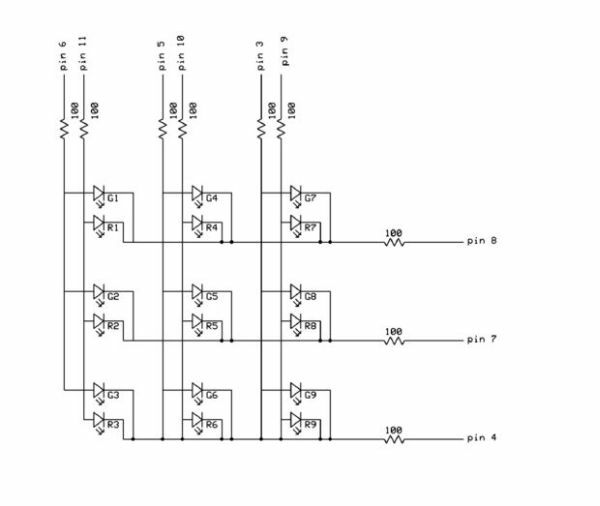 Repeat Steps 1 – 4 until all nine bits have been read. Note that we’re filling the matrix backwards – we start with cell 9, then proceed back down to cell 1. Also, the on-off and colour states are stored as an unsigned integer type (word) instead of a signed integer type. That’s because in bit shifting, if we’re not careful, we might inadvertenly change the sign of the variable.